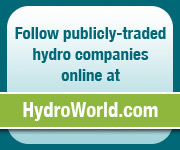 The Oct. 29 deadline to submit an abstract for HydroVision International 2011 in California is approaching. 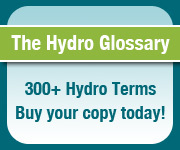 To submit an abstract for HydroVision International 2011, the year's largest gathering of hydropower professionals, click here. PACIFIC GROVE, Calif. -- California American Water files an application with the California Public Utilities Commission (CPUC) requesting permission to remove San Clemente Dam on the Carmel River in order to resolve seismic safety concerns associated with the dam and to restore critical habitat for steelhead trout. 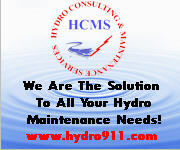 The HydroWorld.com weekly newcast, featuring headline news from the global hydropower industry, sponsored by Hydro Consulting & Maintenance Services. SHENYANG, China -- Chinese energy company A-Power Energy Generation Systems wins a US279 million contract to design and build several hydropower plants in China's Jilin province. For more information, click here. CROYDON, England -- Mott MacDonald, in a joint venture with Coyne et Bellier of France, is appointed by the Water and Power Development Authority of Pakistan as design engineer for an extension project at the Tarbela Dam hydropower project. MANAGUA, Nicaragua -- A bank and companies from Brazil will assist Nicaragua in financing a 250-MW hydropower plant. For more information, click here. DODOMA, Tanzania -- The government of Tanzania signs a deal with Russia-based Borodino for the construction of the Rumakali hydropower plant. Innovative approaches to designing, installing, retrofitting and operating two major components of a hydroelectric plant are saving facility owners time and money. MOSCOW, Russia -- Russia's largest power producer RusHydro and Voith Hydro sign a memorandum of cooperation to upgrade and re-equip RusHydro's hydropower plants. For more information, click here. 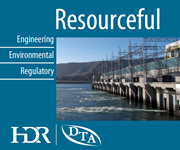 To aid dam owners and managers, the International Commission on Large Dams (ICOLD) offers a technical bulletin specifying a general approach to dam surveillance. TULSA, Okla. -- The editors of Power Engineering magazine and PennWell Corp. announce 11 finalists for the annual Projects of the Year Awards program. Two hydropower projects are among the finalists for this year's awards. HydroWorld invites you to forward this newsletter to colleagues or associates who might be interested in our weekly news summaries. © 2010 PennWell Corporation. All Rights Reserved.